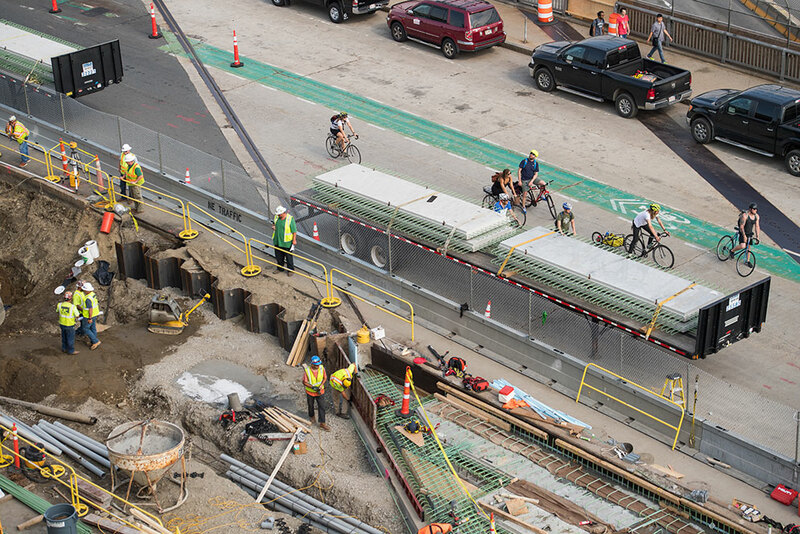 Our work included the utility relocations and ballast excavation work for the Superstructure Replacement of Commonwealth Avenue over I-90 & MBTA Bridge No. B-16-055. Utility installation involved detailed coordination with multiple utilities including Verizon Telecommunications, National Grid, Eversource Distribution, BU Communication, Boston Fire Department, MBTA power & signal/communications duct banks, Boston Water and Sewer Commission ductile iron water line, Boston Transportation Department, City of Boston Lighting Department and all buried utility sleeves under the MBTA Green Line Subway tracks. Our work was performed off hours along Commonwealth Avenue Bridge, in an area that intersects with the Green Line public transportation. For three weeks in August 2017 we worked around the clock to relocate utilities. Our scope of work included the installation of multiple utility crossings beneath MBTA Green Line tracks. Six crews alternated 12-hour shifts, seven days a week to meet the accelerated bridge replacement schedule. All while coordinating seamlessly with multiple contractors, we removed the existing track ballast, removed and replaced the MBTA power & signal/communications duct bank system, as well as provided new conduit systems for Verizon, Eversource, Boston University Communications, Boston Water & Sewer Commission, and Boston Traffic Department signal and city street lighting.